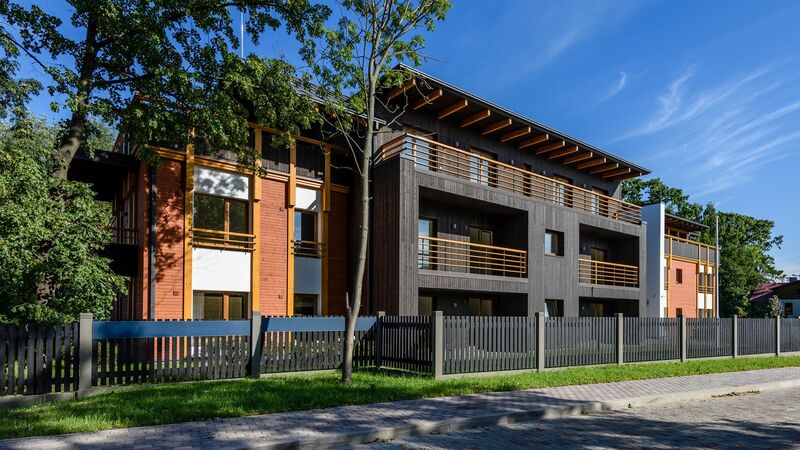 A complex of residential houses is planned built on Ķīpsala (Riga, Latvia) comprising six buildings. The first three-storey building of 10 apartments is commissioned and is now ready for moving in. The new project incorporates modern, high-quality and comfortable two-, three- and five-room apartments of areas from from 56.1 m2 to 143.6 m2 with large terraces or balconies. Apartments are offered with a white/full finish. The building includes underground parking spaces, as well as parking places in the yard. In the basement, small storage rooms for personal belongings are available. A complex of residential houses is planned built on Ķīpsala (Riga, Latvia) comprising six buildings. The first three-storey building of 10 apartments is commissioned and is now ready for moving in. The new project incorporates modern, high-quality and comfortable two-, three- and five-room apartments of areas from from 56.1 m2 to 143.6 m2 with large terraces or balconies. Apartments are offered with a white/full finish. The building includes underground parking spaces, as well as parking places in the yard. In the basement, small storage rooms for personal belongings are available. The territory is arranged with landscaped green spaces, as well as a playground for children. For additional pay the apartment owners are offered parking spaces and storage for the personal belongings. FACILITIES The territory is facilitated - paved roads, groups of greenery of plantations of various new trees, decorative plants and bushes, a children play-ground for children on age 1 – 10 years. Overhead covering: second floor covering from reinforced concrete slabs in two layers. Dividing walls inside apartments: metal core with two layers of plasterboard on both sides packed with stone wool, with water resistant plasterboard on the damp side, packed with stone wool. Inside stairs: Reinforced concrete steps. Ceilings: collapsible reinforced concrete covering panels or concrete or plasterboard, caulked, sanded, primed. Electricity: 3 phase connection to city power grid Switchboard, power points, light switches, connection points for kitchen equipment provided. Light fittings to be provided by client at own expense; wiring provided. Standard power points and ABB switches, color white. Ventilation: Extractor fans fitted in kitchens, bathrooms and WC. Extractor fans in kitchen to be fitted at client’s expense. Connection points for extractor fans are provided. Apartment front door: fire-safe, with doorstep, doorknob and lock. Heating: Heating for the building is provided by steel radiators. The heating system comprises a twin-pipe mainline divided along the lower section and main vertical pipes. Each apartment has autonomous heat energy meters. Air bleeding is performed through the radiators. Heating system release is performed in the technical room. Water: Centralized city water supply. Each apartment is fitted with hot and cold water meters. Electricity: Each apartment has an electricity meter located in the basement. Ventilation: Gravitational and mechanical ventilation planned for the building’s rooms. Fresh air intake planned for residential areas via air valves in outer walls placed in every room. Mechanical extraction fan system planned for bathrooms, separate toilets and kitchens. Phone, internet, TV: The buildings have low-voltage electricity connection and TV data cable. Security features: Intercoms in apartments with monitor and handset, video surveillance. Images and visualizations used on the website yit.lv and other advertising materials are informative in nature. The solutions used in the project may change during the construction process.